August 12, 2017 By Elizabeth Lindemann 2 Comments / This post may contain affiliate links. 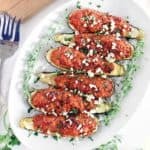 One bite of these Paleo Greek Stuffed Zucchini Boats and you’ll think you’ve landed yourself in the middle of the Mediterranean on a Greek island. 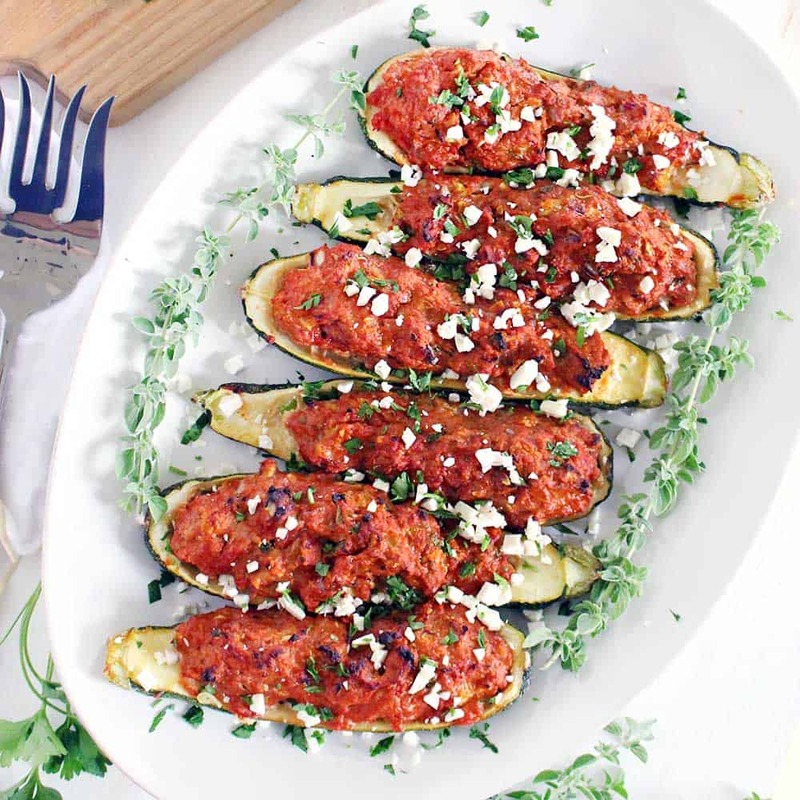 They’re packed with classic Greek flavors from fresh oregano, earthy garlic, and rich tomato paste. They’re low-carb and very healthy, made with lean ground turkey. 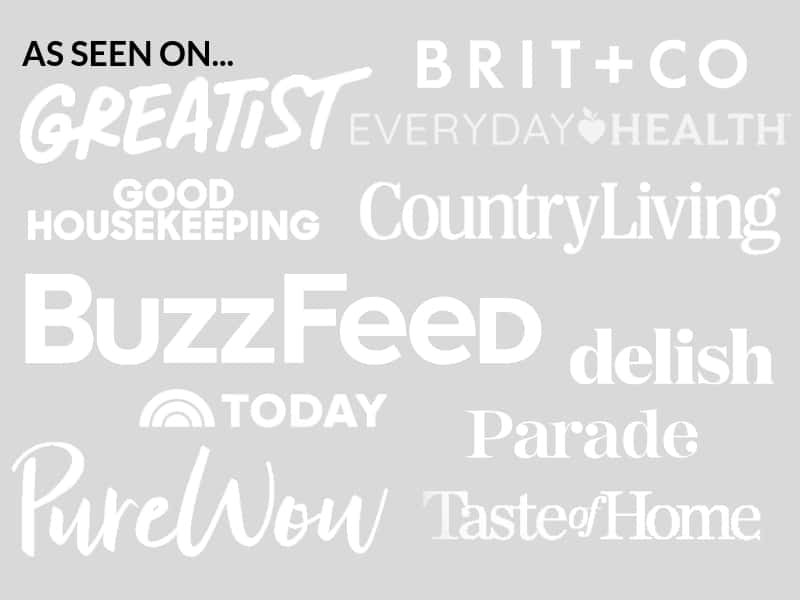 And best of all: they only take 15 minutes of prep. AND, you can make them ahead of time, store in your fridge for a few days, and pop in the oven when you’re ready! You guys- my oregano plant is out of control. I was never able to grow it successfully in Massachusetts. But apparently, oregano just loves the Texas heat. I don’t often use fresh oregano when cooking, so I’ve been trying to figure out more ways to use it, besides drying it for later. It was perfect in this recipe. Fresh oregano is so potent and the flavor seeped into every bite while it cooked. Don’t worry: if you want to use dried oregano for this, you can. I’ve seen a fair amount of stuffed zucchini boat recipes floating around on Pinterest lately, especially because it’s zucchini season. Most of them involve cooking meat first, then stuffing the zucchini, THEN baking. I opted to skip this step. Instead, I mixed the raw ground turkey meat with tomato paste, which gives it the bright red color (and AMAZING flavor), oregano, garlic, chopped onions, and eggs to bind it together. I added the seeds that I scooped out from the zucchini back into the mix, after squeezing the liquid out, along with some salt and pepper. Then, I put the raw meat mixture directly into the hollowed out zucchini. Then, I baked everything at once. The result was zucchini that was very thoroughly cooked (which is how I like it), but still held their shape. I didn’t use any bread crumbs in the turkey mixture in order to make it lower carb/paleo compliant, and I was a bit worried that it would fall apart in the oven and make a huge mess. But the eggs helped firm the mixture up without drying it out, and it came out PERFECT. While there are only 15 minutes of prep for this recipe, it does take a bit of time to cook. Let it cook for at least 45 minutes in order to make sure the turkey is fully cooked. It can be a bit deceiving because the mixture is tinged red from the tomato paste, so it’s hard to cut into it to check for doneness. 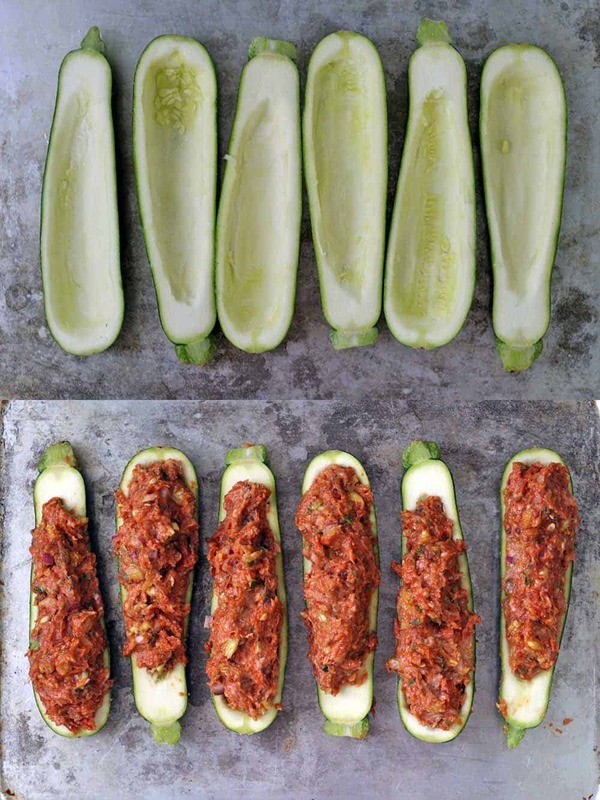 Use a meat thermometer to make sure your stuffed zucchini is cooked to 165 degrees F.
I roasted these on a rimmed baking sheet, then transferred to a platter to serve. Oh who am I kidding, I only put them on a platter to take pretty photos for the blog. Sometimes, I like to pretend to be all fancy-like. Alternatively, you can use a large casserole dish for these. Also, I know what you’re thinking, and yes, that is feta cheese crumbled on top. Along with some chopped fresh parsley. If you’re on a strict paleo/whole30 diet, leave it out. But if you aren’t, do yourself a favor and add it with abundance. We had a simple salad of chopped cucumbers, tomato, and more feta cheese (because, feta), drizzled with EVOO, salt, and pepper. Mmm, mmm. 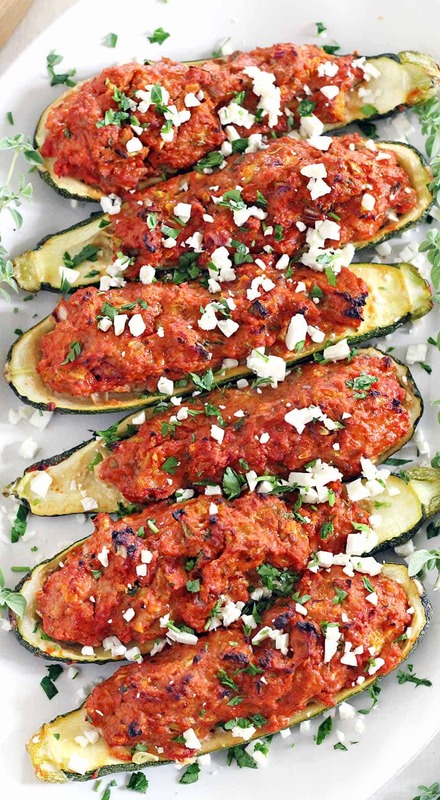 Here is the printable recipe for Paleo Greek Stuffed Zucchini Boats! P.S. If you like this, you’ll love these Paleo Greek Meatballs (Keftedes) with Romesco Sauce. 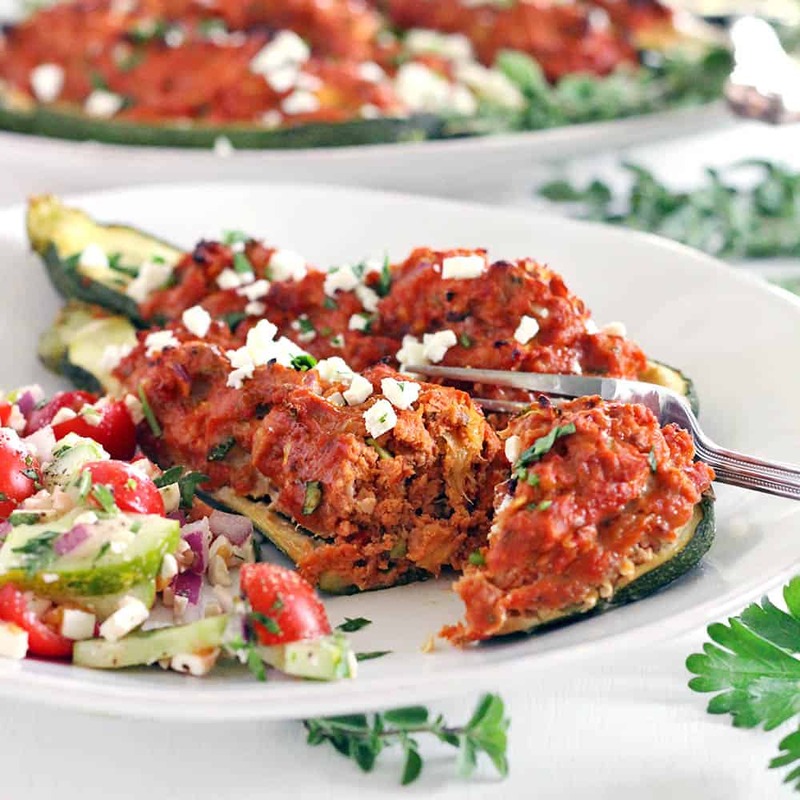 These Paleo Greek Stuffed Zucchini Boats are super healthy and low-carb! Made with lean ground turkey and seasoned with Mediterranean flavors. Only 15 minutes of prep! Slice a VERY thin strip off the rounded back part of each zucchini (so they stay put when placed skin-side down). Reserve strips. Scoop out the center/seeds of the zucchini. Reserve. 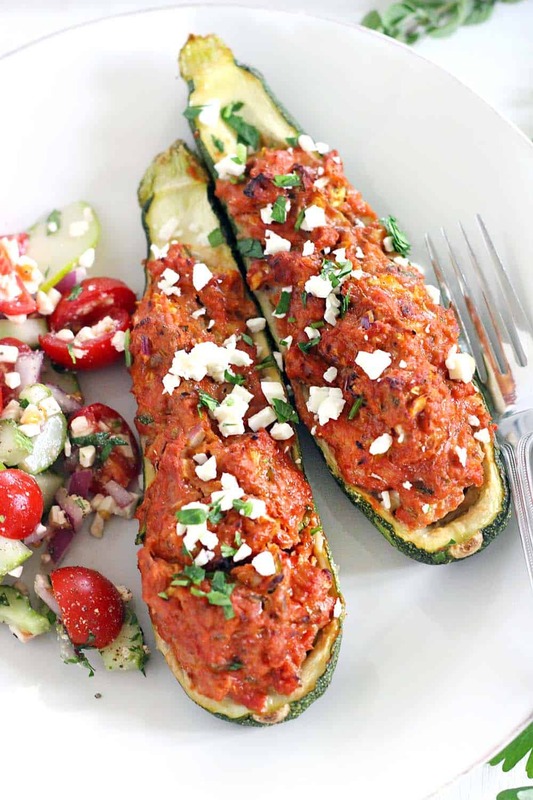 Place halved, hollowed zucchini on a rimmed baking sheet or large casserole dish. Chop up the reserved strops and seeds of the zucchini. Place on a kitchen towel and sprinkle with 1/2 teaspoon salt. Allow to sit for at least 5 minutes while the salt draws out the liquid. Meanwhile, in a large bowl, mix together the turkey, tomato paste, eggs, garlic, onion, remaining 1/2 teaspoon salt, and pepper. Wring the chopped, salted zucchini out with the kitchen towel, squeezing as hard as you can to get as much liquid out as possible. Mix into turkey mixture. 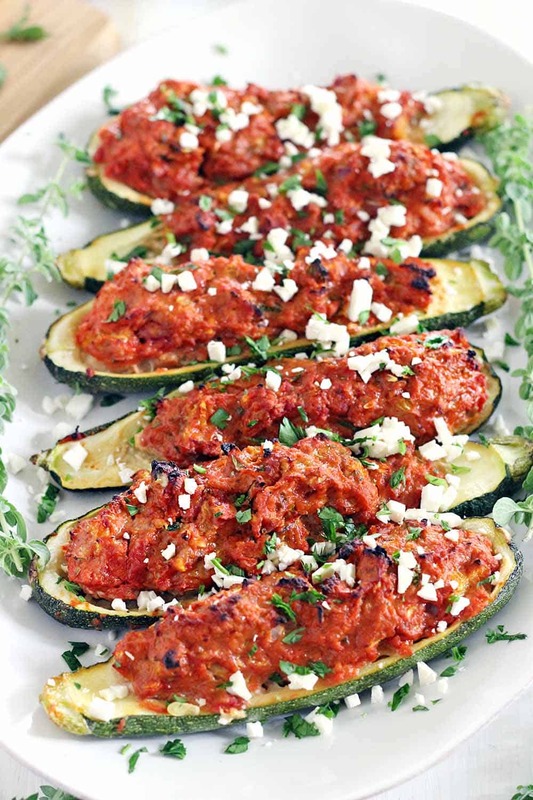 Fill each halved zucchini with turkey mixture. Bake for 45 minutes or until meat is fully cooked to 165 degrees. Serve garnished with crumbled feta cheese and chopped fresh parsley (optional). Stuff the zucchini ahead of time and store in the fridge for up to three days. Bake as directed when you are ready. Maybe I’ll use some of my zucchini for this! Thanks for sharing!